When 2003 Team USA Scholarship winner Charlie Kimball took the checkers at the Honda Indy 200 earlier this month, it capped an incredible weekend for the HPD-supported Team USA program at the Mid-Ohio Sports Car Course. On August 4, Kimball took his Honda-powered Novo Nordisk Chip Ganassi Racing Indy car to victory circle in his first IZOD IndyCar Series triumph, while eight talented young American drivers all hope to follow in his footsteps to racing stardom. 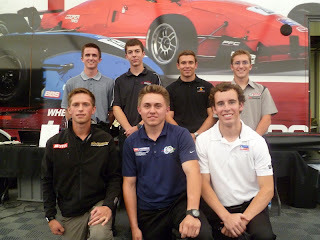 The Team USA Scholarship has been provided opportunities for young American racing drivers since its formation in 1990. Candidates are between the ages of 16 and 22, and must already have demonstrated their potential both behind the wheel and outside of the race car. In recent years, the program has provided the opportunity for at least two winners to travel to Europe and race in ultra-competitive British Formula F championship series events. Honda Performance Development has supported Team USA since 2010, and this year four of the nominees – all Formula F racers – are already members of the Honda Racing Line, HPD’s program to support licensed participants in sanctioned amateur and entry-level professional racing. Honda Racing Line members Jake Eidson, 18, the current F1600 Formula F Championship Series points leader; his championship rivals Adrian Starrantino, 18, and Aaron Teletiz, 21; and Pacific F1600 Championship racer Joey Bickers, 18 are all among the eight finalists for the 2013 Team USA Scholarships, along with four other race winners in other disciplines. All eight took part in the Honda Indy 200 race weekend at Mid-Ohio, where they were interviewed by a panel of racing veterans on Friday evening. Afterwards, they watched as 2012 scholarship winner Matthew Brabham swept to a pair of support race wins on Saturday and Sunday, while fellow Team USA graduate Kimball capped the weekend with his thrilling IndyCar victory on Sunday. “It was just an incredible weekend,” said noted motorsports journalist and Team USA founder Jeremy Shaw. “I am so grateful to everyone who took time out of their hectic schedules during the race weekend to share their experiences with the next generation of racing stars, and thrilled to see so many of our previous scholarship winners performing so well on the track. My name is Corey Fergus. 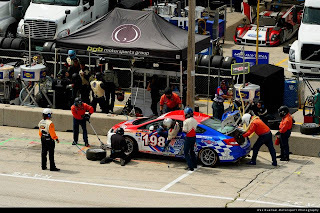 I race the #198 Honda Civic Si for RSR Motorsports in Grand-Am’s Continental Tire Sports Car Challenge with co-driver Chris Puskar. The eighth round of the Continental Tire Sports Car Challenge was held at Road America, in Elkhart Lake, Wisconsin, home of the Johnsonville brat and Sargento cheese. No wonder it’s my favorite track in the nation. I think one of the reasons why I like it so much is because of the area that surrounds Road America. It’s a beautiful area that reminds me of Northern Michigan, where I grew up vacationing at our family lake cottage. As far as the track itself, it’s a 4-mile beast. It’s fun to drive and has one heck of a gutsy turn, the kink: a 120 mph turn that’s blind at turn-in. You better have your turn in spot nailed; otherwise you’re in trouble. In fact, one mistake around the 4-mile track can really hurt your lap time. I like that it takes precision and consistency to be fast here. With over a 2:30 second lap time, it rewards drivers that are accurate and make minimal mistakes. Not only was I excited to be heading to Road America because it’s my favorite track, but the American Le Mans Series and Grand-Am were racing at the same venue for the first time ever. 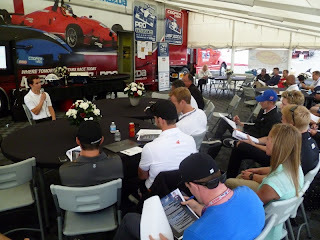 In anticipation of the merging of ALMS and Grand-Am next year into the United Sports Car Series, we had scheduled one joint event for the year. I guess fans were excited too, because the pre-event sales for this were three times as high as the NASCAR Nationwide race there in June. It’s always fun to see lots of fans at our races. Because of the two series being together, our schedule was very spread out. Four days on track! On Friday we were done at 9:30 am so my family and I went fishing on Lake Michigan. My dad and I are pretty big fisherman so it was pretty cool when I caught an 8-pound Rainbow Trout. On the track, we spent most of our time getting the car set up for the race, trying to get a balanced setup that would not just turn a quick lap, but be consistent throughout the 2.5 hour race. We felt pretty strong heading into qualifying. Chris did a great job and put us in 3rd for the race. This race like the last, I was the finishing driver. Our race started off with a bang, literally, as Chris got hit on the first lap dropping us to dead last. He worked his way up several positions before pitting for our driver change. 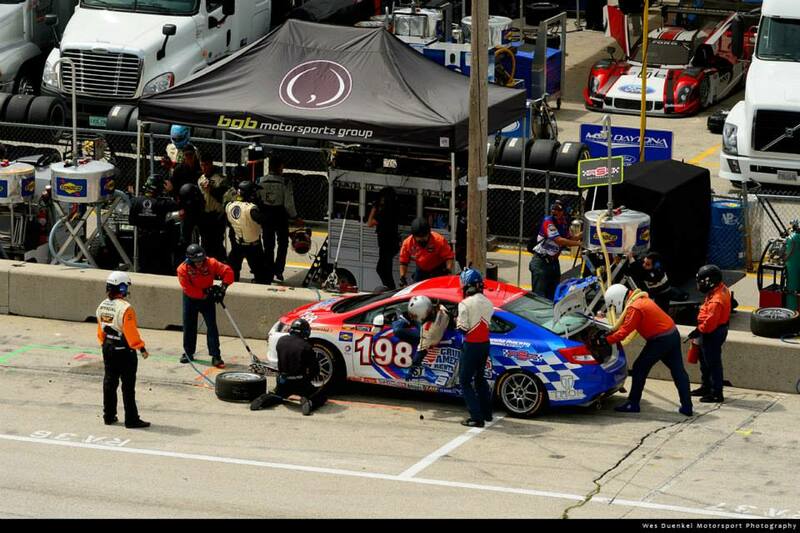 During our pit stop a GS car blocked our pit stall, causing us to have to wait until they were done. Then, because of the car hitting Chris on the first lap, the driver side door wouldn’t open, forcing us to hop in and out of the window. By the time I took off, I was in 23rd spot. In 30 minutes I managed to work my way up to 7th. But on lap 22 someone apparently forgot where the brake was and t-boned me hard, ending our race. It just wasn’t our day. As it turns out it wasn’t our team’s day either. We had all three team cars in the top 7 when I was taken out. The #197 car developed some issues later and the #196 car had about a 15 second lead with just over a lap left in the race and they ran out of fuel. 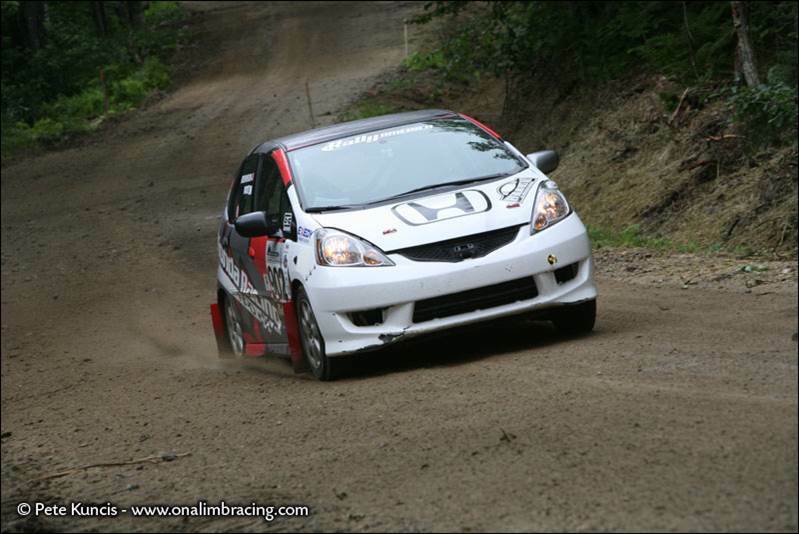 The Hondas were doing really well at Road America. Unfortunately the results don’t show it. We’ll just have to do well at our next race at Kansas Speedway, August 17 in Kansas City, KS. 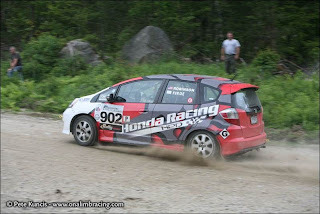 Team Honda Research partnered with Honda Performance Development to showcase the B-Spec Fit developed specifically for Rally competition at the New England Forest Rally (NEFR), fifth round of the Rally America National Championship. The team was in for even more challenges before the beginning of this notoriously rough event. 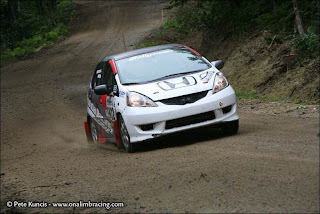 The B-Spec Fit’s regular co-driver had to be replaced with a new THR team member, Zach Jacobs. 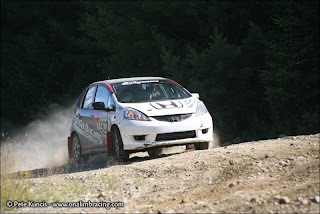 Unfortunately, Zach’s flight to Maine was cancelled at the last minute, leaving the Fit without a co-driver and on the brink of having to withdraw from the event. Ross Forde is no stranger to Rally, and has an extensive winning resume to back it up. As the winner of the prestigious Billy Coleman Award in 2008, Ross has extensive experience in 2WD rally cars very similar to the B-Spec Fit. “With Ross in the car, we should not only have a safe and fast race, but also a chance to pick the brain of a fellow competitor in these types of low-cost rally cars,” Robinson observed. Moving into the second day of competition, the B-Spec Fit continued to build a lead over the Toyota. 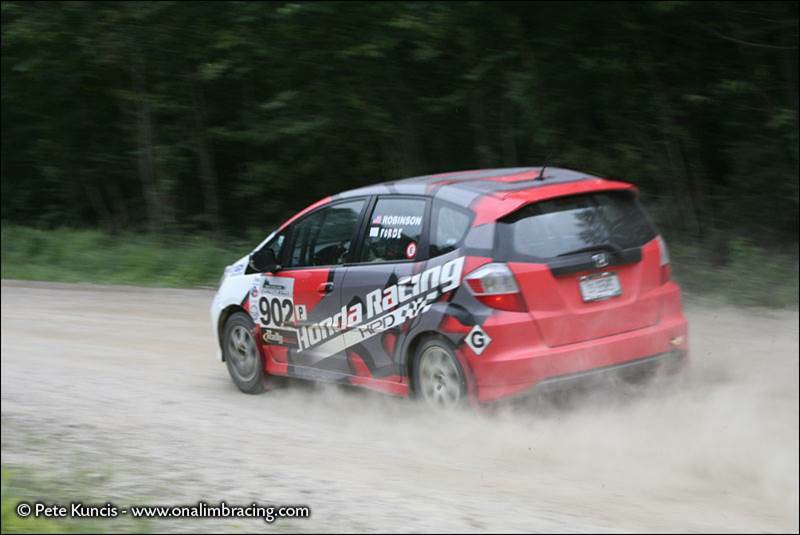 By Stage 7, the team had built up an eight-minute lead over the second-place Toyota Yaris. This lead would come in very handy, as Stage 8 caused some serious damage to the Fit, and to the times for the remaining five stages. 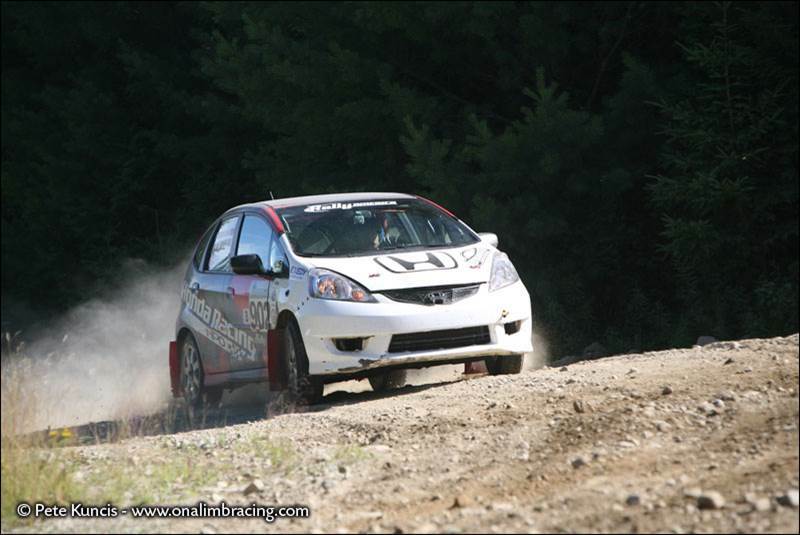 With the expert help of co-driver Forde, the B-Spec team stuck to a conservative driving style and nursed the Fit through the remaining stages. To add more stress to the event, as the THR team finished the last stage and began the 23-mile transit to the finish of the race, the damaged accessory drive (which runs the alternator AND water pump) failed, as well as one of the engine mounts which had absorbed much of the impact at Stage 8. With some careful jury-rigging of the remaining serpentine belt and very gentle driving, the team was able to make it to the finish time control, in one piece and on time. 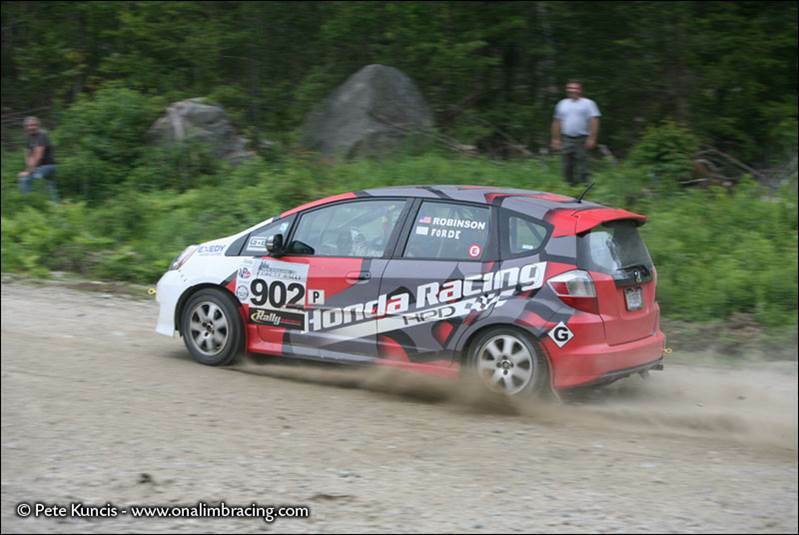 Look for the THR B-Spec Fit at the next round of the Rally America National Championship Series, on August 23-24 in Detroit Lake, Minnesota. 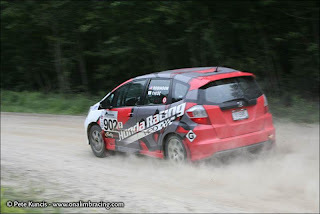 The fifth race on the Rally America National Championship schedule and always a favorite with drivers due to the technical demands of the course, the New England Forest Rally offers challenging logging roads with some of the longest stages on the Rally America National Championship. This rally is also a crowd pleaser because of its stunning scenery and wildlife. Quintessential northeastern settings such as winding creeks and one-lane bridges add not only beauty to the race, but also excitement, when encountered by drivers at breakneck speeds. Indianapolis Motor Speedway was home to our seventh race of the season. Just being fortunate enough to race at Indy is an accomplishment. Winning at Indy is something every driver dreams of, no matter what series you are apart of. It’s so special because of its history. I even have some history at the track. Since I was a young kid, I have attended the Indianapolis 500. Our family has had tickets to the race for about 50 years. We still sit in the same section. Not to mention, my great grandfather crewed for Eddie Rickenbacker at the Indianapolis 500. So it was especially meaningful when I found out I was being given the opportunity to be the finishing driver for this race. For our team, this meant the driver lineups were going to change a bit. I switched cars, to the #198, and co-drivers, now driving with Chris instead of Owen. Our team owner Randy drove with Owen in the #197. This new role is something I’ve been looking forward to. Because I want to make racing a career, finishing was something I had to step into at some point. Being the finishing driver means you’re the closer. It’s up to you to win the race. Generally this also means that you drive for a longer stint as well. Being used to the starting driver role, where it’s your job to bring the car back in one piece and in a good position for your finishing driver, I had to change my mindset a little. You still obviously want to make smart decisions in the race car, but as the finishing driver you can afford to take more risks and be more aggressive. You have to if you want to win. At Indy, you get very little track time because we race the same weekend as the Brickyard 400. Last year our whole event took place in one day! This year we at least got two days on track but everything was still rushed. So for practice we knew we had to get the car dialed in quickly. When qualifying came around, Chris did a great job and put us in 6th, the highest qualifying Honda. In the race he had us up to 2nd before we pit for our driver change. Unfortunately in the race we developed some car issues, which made it difficult to fight for position. But we were still hanging in there. Then a Mazda that was a lap down hit us and caused the bumper to drag, forcing us to make an unscheduled pit stop under green, ruining our chances at a good finish. In the last few laps we gained five positions but still finished 14th. I wish things would have turned out differently for our car but it was still a good learning experience for me. I really enjoyed being in the finishing role and I’m ready to step up to the challenge again at Road America, my favorite track, August 10th in Elkhart Lake, Wisconsin.